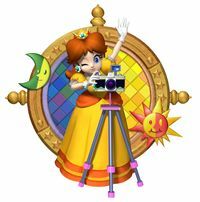 This article is about the minigame from Mario Party 6. For Peach's special move in Mario Strikers Charged, see Freeze Frame!. For the N-Gang comic, see here. 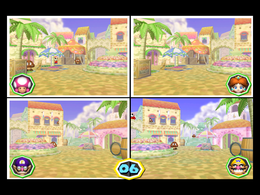 Freeze Frame is a 4-player minigame in Mario Party 6. Freeze Frame is a play on words on the cinematic technique, "freeze frame". There is a page in the Miracle Book that features this minigame, titled, "Say Goomba." 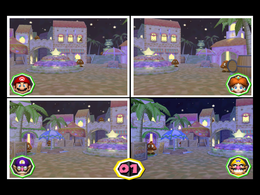 The camera first shows the player viewing the area, with all the Goombas exposed. The Goombas then hide as the camera zooms into the player. Rules – "You have one shot to capture as many Goombas (or UFOs/Shy Guys) as possible in a photo. Whoever captures the most on film wins!" Advice – "Each Goomba in your photo will earn you one point. Each UFO or Shy Guy will earn you three points." This page was last edited on October 1, 2017, at 12:38.